atelierniSHASHA: My Storage Story - a Diorama, Storage Shelf and Photoshoot Studio in One! My Storage Story - a Diorama, Storage Shelf and Photoshoot Studio in One! Hey, dollies! How is your weekend coming? Mine is somewhat different.. I never touched a needle since Friday night! Haha! Well, now it’s time to discuss about the top challenge that we came up with based on the sort of survey we had a couple of weeks ago – Storage! Now, to tell you honestly, I don’t have an exact solution for everyone, but I am hoping that through this post, everyone can share their helpful tips to our fellow doll lovers. One can then pick a tip or two that they can apply based on their circumstances. Isn’t that neat? Storage is, for me, the second most challenging aspect of my doll collecting. Budget will always be the top one, because I guess I still want more dollies LOL. There are dolls that I would love to join my pack, but it may take a while to fund them. Perhaps when I overcome the first challenge, which probably yielded a huge number of dollies to store, that is when Storage becomes my top challenge. When I was young, I would put my collection on a display shelf in the living room. I’m not sure if this is a pan-Asian culture, but most houses here in my country back in the day almost always had a shelf for collectibles or precious items and used as a living room decoration. Here’s 11 year old me with my little ones at my grandparents’ humble wooden home where I spent my first 21 years in. I remember being very proud as a child about my tiny collection, which immediately catches the attention of kids and neighbors who visit our home. Since I play with these dolls almost every single day during the summer vacation, the shelf is well-maintained and always dust-free. In the tropics, dust is common so we clean our open shelves very often. During school days, the dolls wait for me to pick them up on weekends so I can bring them to my improvised playhouse at the corner of our veranda. Now that I’m married with a home of our own, having a shelf full of dolls in the living room may not be much of good idea. Aside from the living room being a really small space, I live with boys. For almost 9 years living here, I relied on a neutral, minimalist look. Since coming back to doll collecting in 2010, I just store my dolls in their boxes. This was practical at that time because when I started building my new (adult-stage) collection, I came up with the idea that I can only continue with this collecting thing IF I had an additional income to support it with! That’s when atelierniSHASHA started. As I became a product maker mainly, my girls became more like my muses. And they had to be “readily undressed” all the time so that it’s easier for me to just pick them up for pattern making and fitting. But then I really felt bad for my girls. 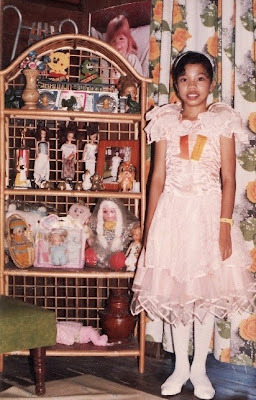 As I mentioned earlier, I grew up to regard dolls as works of art and that they are sort of like the focal point of a room. And other than that, I needed a photoshoot setup that is almost always ready when I’m done with my tiny fashions. Setting up a backdrop every time I finish an outfit can be time consuming. And lastly, delicate Momoko dolls shouldn’t be in boxes along with other girls. I know now that was a bad move. And I only realized it when I saw them chipping. Their hands, ankles, even the head. Ugh, so so sad. So I decided to commission a local cabinet-maker to make me a living room diorama box. I thought it would be nice to let my girls lounge in there while waiting for their turn at the atelier. I placed the diorama box near a window so it is well-lit. I made them a couch, placed one of my watercolors on the wall, and got some of my collected travel trinkets become their room’s art decos. Finally, my girls have a nice home! Then, came another sub-challenge. Since the diorama is in the living room, little kids (relatives and neighbors alike) wanted to play with them. I allowed it for one time or two, but since little kids are little kids, they do not play carefully and it’s a pain to see! So I put them back to their boxes. It’s for their own good. LOL! Since January when I have finally focused on my miniatures, I am not anymore working from a corner of our living room but safely in my son’s vacant room. He’s 9 but still likes to sleep with Mom and Dad. I can now easily have the girls lounge in their living room while I lock them up when kids visit the house. Easy peasy haha! But since some of my dolls are not articulated, I still have them in boxes. I am planning to add a few more boxes when budget allows for it, so there will be a kitchen, a bedroom, a veranda, and who knows what’s next. Everyone will then be in their appropriate rooms (standing girls can cook in the kitchen or sleep in bed teehee)! So basically, my diorama is also my storage shelf and a photoshoot setup when necessary. There goes my doll storage story. How about you guys? How did your doll storage evolve? How did you make it work? We would really love to know and discuss solutions over here. Please feel free to reply to comments. I am so excited to join in the fun discussion! It was common here too to have shelving like yours. I had one in my house (I am a bit older than you :-) )I still have not completely solved the storage problem although I am working on it! Also, you look so adorable! That is a nice way to store you dolls. It is kind of like two in one. My doll room is a work in progress. I can't wait to get back in there, but time is not permitting right now due to other obligations. Dioramas are so fun to create. I look forward to seeing your other rooms. The cabinet sounds nice! When I first started collecting, I only had a small collection of some vintage Barbies and DOTW dolls. My daughter had many, many playline dolls (I confess to getting a lot for her because I loved to play with them with her!). 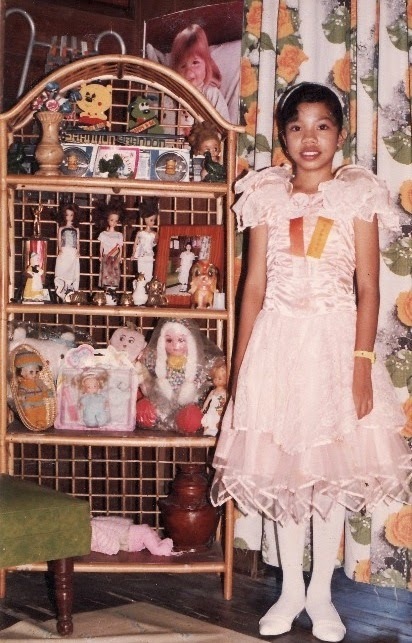 In the house we had at that time, there was built in hallway shelving that I used for my dolls. When that started getting crowded, I used an old set of deep shelves to put some of the dolls on. My daughters dolls were kept in her bedroom. I remember we got department store dress boxes that we lined with towels and cut up an old blanket to make sleeping quarters. Boys and girl dolls stayed in separate boxes. I remember my daughter used to have me help her put them in pajamas (some of which we made out of old socks) every night and we put them all to bed in the boxes. After moving to my current home, my collection grew exponentially and I purchased a large display cabinet with a glass sliding door and glass sides. This cabinet is in my loft area and is still the home for my vintage and collectible dolls. These are the dolls I don't play with, I redress some of the vintage dolls for the season, but these are basically left untouched and preserved in their original condition. I filled the rest of the loft with shelving and I also built a large shelving unit as a doll house for my youngest daughter. In the shelving units, we set up dios for the dolls and used the tops of all the shelving to store my dolls that didn't have homes and the overflow was stored in plastic bins. This quickly became over populated and as my daughters both grew out of playing with their dolls (and I took over many of their dolls into my collection! ), the loft area became to small. Now I have moved everything except for the glass display cabinet to the basement. I have converted additional shelving units into dios and then some are in a pre-dio stage with no walls between the room, but with furniture placed in the prospective rooms. I again have shelving units without funiture that have many, many, many dolls standing in them. I still have a few dolls in plastic storage containers, but have a long way to go towards getting things organized! I may post some pictures on my blog as I get more organized! Wow! You have already done so much about storage, Phyllis! I was thinking like this is the the shelving queen while I was reading your comment hihihihi I did think of putting shelves by the stairway but again, I always thought the house might feel too girly hahhaa But I do see the practicality of shelves. I may get one soon. 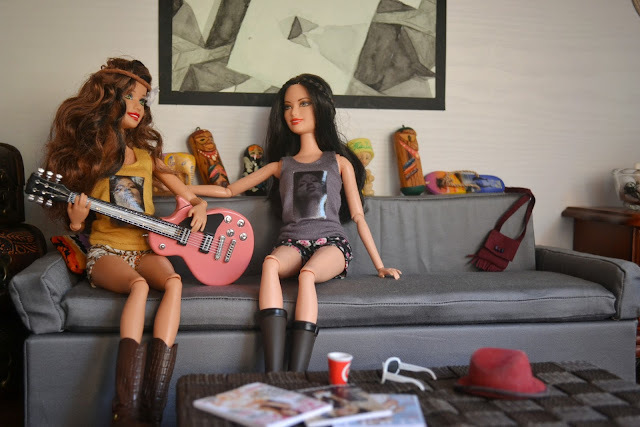 I love your stories about you and your daughters playing with dolls - so sweet. I didn't have a sister, but I did have cousins and playmates I get to play dolls with. But a mom and daughter playtime is probably so much fun. Thank you so much for sharing those beautiful memories and your shelving tips with us, Phyllis. I'm sure a lot of us can relate to this story. Hugs! You were so adorable! Storage has never been my issue. ORGANIZING my space is my challenge. I'm happy to say that I am doing better at it. I would just love to have one of the TV personalities come in and do it the right way from the beginning. I'm pretty good at keeping things a certain way. I just don't want to take the time to get them that way. I used to teach porcelain doll making from my home basement studio. Everything was perfectly laid out with the proper shelving, displays, etc. Having students come to your house every week tends to motivate you to keep it looking nice. If you are going to suggest I invite people over regularly to my studio.....don't! Lol. I'll figure out something. Thanks for sharing your story with us. Oh, Vanessa... I remember getting so inspired with your craft room a few months back... I wish I had an entire room for my craft, too hahahha... But it's okay for now, someday perhaps when I get enough funds. You are correct that when you have enough space or storage, the next challenge is organizing. It takes some time and proper planning, and oftentimes we neglect doing so because our hands are already full with the crafting itself. But I find it much more effective to re-layout when needed, based on what I need. So everything I have is modular, movable. But someday, when I have my own studio, I'll definitely have a stationary table and shelves, for the basic stuff, and movable furniture if needed.